Nehemiah 4:1-6 1 When Sanballat heard that we were rebuilding the wall, he became angry and was greatly incensed. He ridiculed the Jews, 2 and in the presence of his associates and the army of Samaria, he said, “What are those feeble Jews doing? Will they restore their wall? Will they offer sacrifices? Will they finish in a day? Can they bring the stones back to life from those heaps of rubble—burned as they are?” 3 Tobiah the Ammonite, who was at his side, said, “What they are building—even a fox climbing up on it would break down their wall of stones!” 4 Hear us, our God, for we are despised. Turn their insults back on their own heads. Give them over as plunder in a land of captivity. 5 Do not cover up their guilt or blot out their sins from your sight, for they have thrown insults in the face of the builders. 6 So we rebuilt the wall till all of it reached half its height, for the people worked with all their heart. Overall Background: The Jewish people in Jerusalem were under great distress and reproach until Nehemiah came and encouraged them to rebuild the wall of the city. Priest and people, young and old, men and women, boys and girls came together to rebuild the wall and to repair the gates of Jerusalem. What an awesome sight that was—people of God working together in unity and vision and faith! Just when it seemed that nothing could go wrong, opposition came in the form of ridicule. Listen to verse 1 “When Sanballat heard that we were rebuilding the wall, he became angry and was greatly incensed. He ridiculed the Jews,” Literally it means – He was hot and irritated and he began to mock and make fun of the people rebuilding the wall. Application: I believe there are people here this morning that have abandoned their dreams, God-given goals because someone ridiculed you and made fun of you. Let the Holy Spirit bring healing to your life so you can dust yourself off and get back in the race by the grace of God. 4 things we will see through the example of Nehemiah on how to deal with ridicule. Question #1 “What are these feeble Jews doing?” The word “feeble” is the Hebrew word “melal” which means “frail” or “miserable” or “powerless.” The word “melal” is related to the Hebrew word “mulah” which means “feverish” or “sickly.” This question ridicules our physical features. Sadly, sometimes it starts very early in life. Even when we are kids, we are made fun of and ridiculed. Question #2 “Will they fortify themselves? You are not wall builders. Have you seen what a real city wall looks like? You can almost hear the Samaritan army laughing at this point. This question ridicules our capabilities. Question #3 “Will they offer sacrifices?” Back in those days, before starting a building project – whether it was a wall or a bridge – they would offer a sacrifice (sometimes even an innocent child) to please the gods so that the wall would last and the bridge would stand. “You don’t have enough sacrifices to get this project going. You don’t have a prayer.” This statement was mocking Yahweh God. This question ridicules our faith in God. Question #4 “Will they complete it in a day?” You are all fired up about building the wall. Wait till tomorrow when you are sore and the money runs out. Do you have enough determination and resources to keep going? This question ridicules our ability to finish a job. Question #5 “Will they revive the stones from the heaps of rubbish—stones that are burned?” If you remember, the gates had been burned by fire, so some of the stones had been damaged. Being made of limestone, you can just imagine how the stones had cracked and disintegrated. This question ridicules our resources. As Sanballat is going on and on ridiculing the people, Tobiah joins in. Chuck Swindoll says on this point – “Critics run with critics.” 3Now Tobiah the Ammonite was beside him, and he said, “Whatever they build, if even a fox goes up on it, he will break down their stone wall.” Meaning: You don’t need an army to bring down those walls. A little fox can do that. That was not true. Archaeologist Kathleen Kenyon proved that the Nehemiah’s walls were 9 foot thick but mockers use lies to discourage. Nehemiah remembered every one of those statements of ridicule. For e.g. When we began the process of transition for our church, some people ridiculed us. Who do you think you are? You do not have what it takes. It’s not going to work. Some people questioned if I would stay with it. I remember every one of those questions of ridicule. We’ve all heard the saying – “Sticks and stones may break my bones but words can never hurt me.” That’s just not true. Words of ridicule can break us. They can demoralize us. They can keep us from doing what God has called us to do. But for the grace of God, we would not have made it. Application: All of us at some time have faced ridicule—something about our looks, our capabilities, our faith, our persistence, our resources, our goals in life, and even our faults. What has ridicule done to you? What God-given goal in your life has been sabotaged because of ridicule? Let me switch it around: Are you ridiculing someone right now? Are you playing a Sanballat or a Tobiah in someone’s life? It’s time to stop. 1. He Remembered the Ridicule. – He could have become angry. – He could have argued with Sanballat and Tobiah. – He could have tried to buddy up with them. – He could have believed them and given up. Instead, he turned towards God. Listen to his prayer: 4Hear, O our God, for we are despised; turn their reproach on their own heads, and give them as plunder to a land of captivity! 5Do not cover their iniquity, and do not let their sin be blotted out from before You; for they have provoked You to anger before the builders. 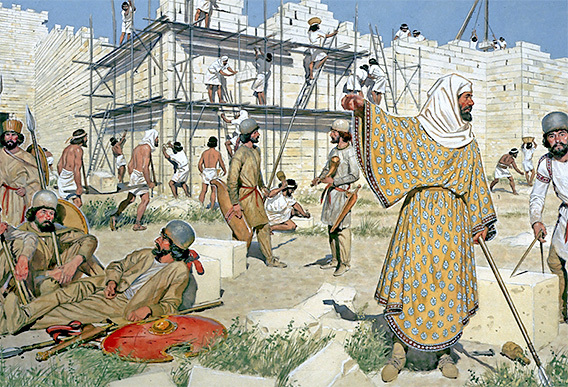 Nehemiah rushed to the audience chamber of God. He was a man of prayer. He knew that God was aware of what was being said against him. 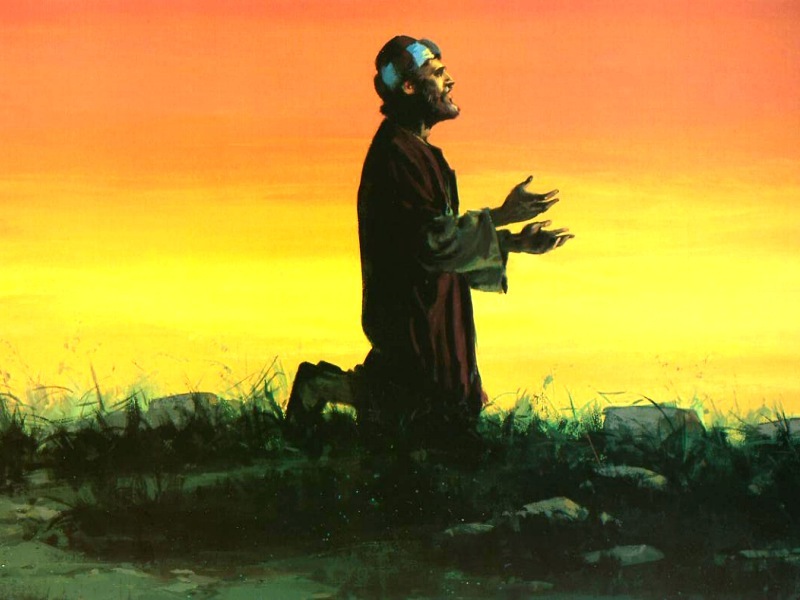 He prayed what is known as an imprecatory prayer, where he prayed for God’s judgment upon the enemy. Now someone will say, “how awful is that prayer compared to Jesus who prayed ‘Father forgive them for they not know what they do.’” Nehemiah was not praying for personal vengeance. He was reminding God that the enemy had dishonored Him. They were provoking Him. So He took his case before God. 1. He Remembered the Ridicule. 2. He Responded in Prayer. III. HE RESOLVED TO GUARD THE VISION. No matter what age you are and what you are attempting to do, someone somewhere will ridicule you. Just expect it. Just get used to it. Pray to the Lord and renew your vision. Application: What dream/vision/goal has God given to you that because of some ridicule you gave up? It’s time to renew that vision. Don’t give up your vision. Guard God’s vision for your life, marriage, children, work, and ministry. 1. He Remembered the Ridicule. 2. He Responded in Prayer. 3. He Resolved to Guard the Vision. IV. HE RESTED IN GOD. Background: Nehemiah did something very powerful. He rested in God. He let God fight His battles. Application: The Enemy wants you to think that God has nothing special for your life. He wants you to think that God has withdrawn His vision. You are more important to God than you think. His vision for your life, marriage, children, work, and ministry is still alive. It is time you pick up your pieces and get back in the race. You say “I can’t fight.” That’s good! Let God do your fighting for you. He wants you to let Him take the lead. It’s His vision anyways. If you’ve never given your life to Christ and received Him as your Savior, then do that now. That’s when it starts.